I wanted to make something pretty and girly for both my Valentine girl and me and my ideas revolved around making toppers that we would be able to use as decoration. But as I started working with the wire, it struck me that bookmarkers would be much more appreciated and I settled for that idea. This is a good, no sewing idea that works up fast. Cut about 50 cm of wire and twist it in half. I wanted something sturdy, so I doubled the wire. Shape a heart at the top and braid the wires together to the end. Cut a strip of tulle, tie at the inside of the heart's neck. 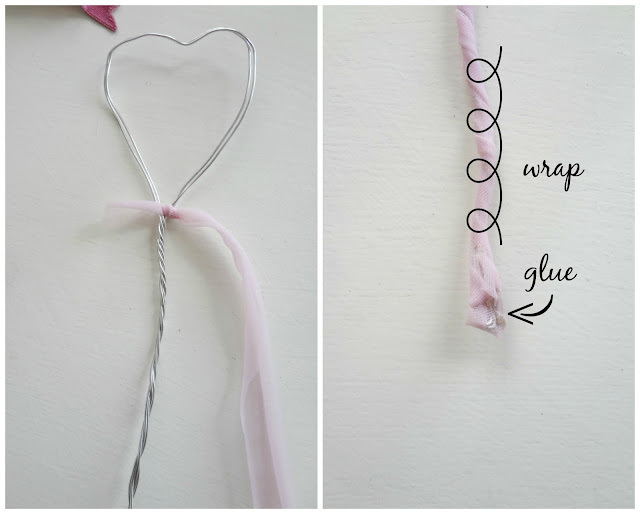 Wrap the tulle around the wire all the way down and glue the bottom part. 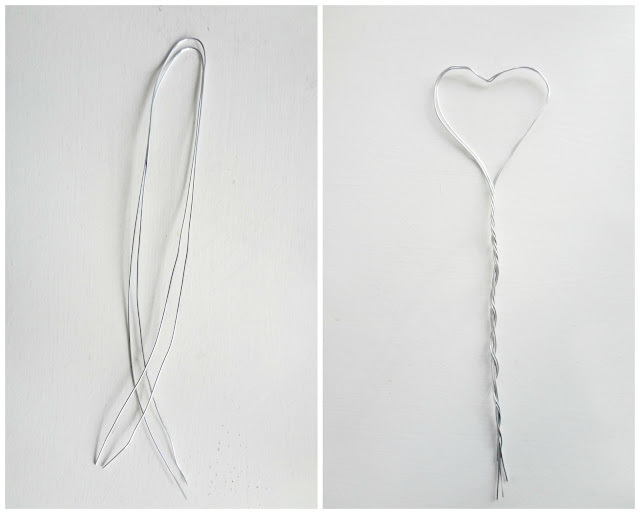 Cut a longish piece of ribbon and tie it at the neck of the heart. The ribbon is supposed to hang down. I wasn't satisfied how the light pink tulle's end was glued so I glued a small piece of lace to hide it. 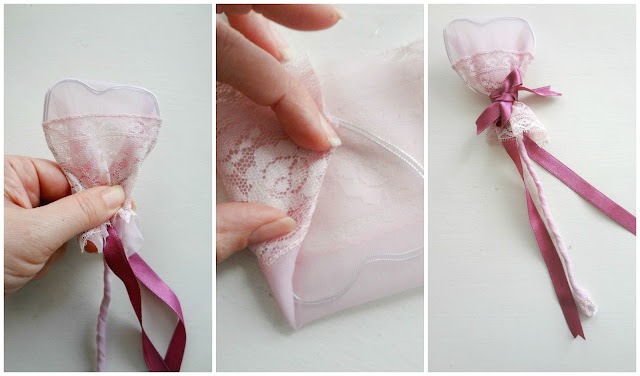 Cut a rectangular piece of lace (about 15 cm long) and insert the heart inside. Gather the sides carefully, tucking them in behind and tie a short ribbon over it to secure it. 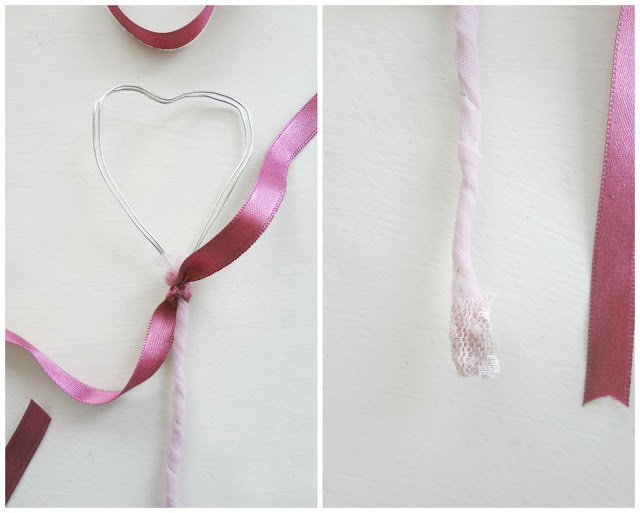 For this bookmark, for the heart part I put the tulle as for the first one, added a piece of lace over it and tied the ribbon. Everything's done in 10 minutes (and maybe less!). I've already made a Valentine's Shawl... No more Valentine's things planned here though. I like your bookmarks, very romantic and delicate! I love the vintage quality of these bookmarks. Such a lovely and creative idea, Maya! These are the prettiest book markers, so different. But all of your jewelry is so unique as well! Beautiful Maya. Thank you for sharing at Create, Bake, Grow & Gather this week.